A set of three diffuser covers for the 38cm Ezybox Hotshoes. Each cover features a black cut out mask (2 rectangular and 1 circular) with a 2 stop diffusion panel. 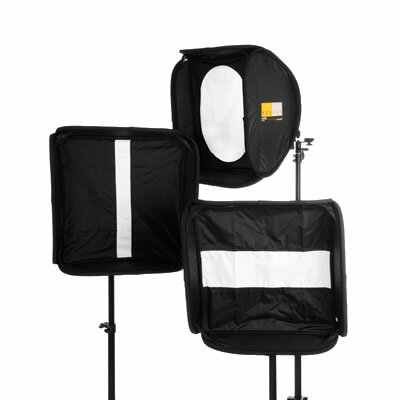 The cover simply attaches to the front of the softbox and can be used with or without the diffusion layer(s) supplied with the Ezybox Hotshoe. Whether you are looking for a different 'catchlight' shape or want to experiment with creative lighting these new covers provide a really useful accessory for the Ezybox Hotshoe range.